Here is a toolkit of 50 tried and tested, simple and effective stress management strategies to relieve stress and help you relax. Easy and quick to implement and above all they WORK! 'Every so often, a book comes along which is simple yet life changing in its application. This is one such book. Straightforward tips that are easy to put into practice to provide relief from stress. As a therapist and coach, I have used many of these tips both myself and with clients and it’s a joy to see they are at last available in one, easy to access place. 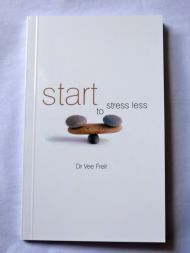 START to Stress Less is a pocket book which will show you in five easy steps how to deal with unwanted stress and costs £4.95 (plus p&p). START stands for Stop, Take stock, Acknowledge, Relax, Take action. Using these five steps can help you to stress less and manage your life in a better way. The only way now to buy a copy of the book is to get in touch with me. Please go here and send me a message. 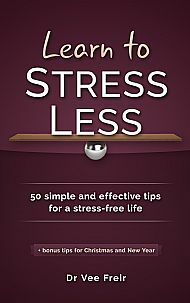 'START to Stress Less is a little book with big power. It shows how to reduce unwanted stress in five easy, effective steps. As a reviewer said, "Dr Freir doesn't take 200 words to say what can be said in 20 words. She just says 20 words. Her advice does not require you to go into a special room each day (who has time for that?). You can use her advice right in the middle of your worry and anxiety and bring it to an end in a way that leads you to solution to what is worrying you. Absolutely brilliant." And I completely agree. I am not a fan of many self-help books as I often find them patronising or unnecessarily waffly. This is neither.